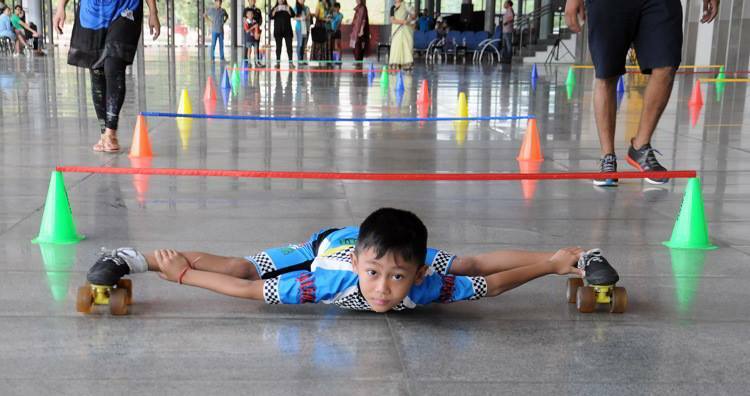 New Delhi, Dec.23 : Seven-year-old Tiluck Keisam, a limbo skater from Manipur, has created a new world record of limbo skating under bars to the farthest distance. Tiluck Keisam is the son of Keisam Ricky and Pravabati Takhellambam from Manipur. On December 20, Tiluck made India proud when he bettered a world record in the Farthest Distance Limbo Skating under Bars at the Siri Fort Stadium in New Delhi. He covered 116 meters as against the previous record of 50 metres in 31.87 seconds with cones and bars under the bars which were set at the height of 28 cm from ground level against the required 35 cm and the gap between the bars was kept to 1.0 meter. He covered 144.7 meters without cones and bars in 56.01 seconds in a single run only. A Class two student of Bluebells School International in Delhi, Tiluck has been skating since 2013. He has participated in various competitions and so far won a total of 42 medals and many certificates. Tiluck has already etched his name in the Limca Book of Records on 25th May this year by performing a 50-metre limbo skate under a horizontal bar set at the height of 7.5 to 9 inches from ground level. Under the guidance of Coach Rohtash Dinodia, Tiluck was adjudged as the overall best Limbo skater for the year 2014-15. Recently, Tiluck also appeared on the Reality show “I can do that” where he performed skating with a Bollywood celebrity. A senior official of the stadium said the association planned to send the video of his performance to the authorities of the Guinness Book of World Records.